OK…OK…I know what you’re thinking. Two Chipotle Mexican Grill fundraisers in one week? How much Chipotle do you expect me to eat? Well, this one’s worth it. Read on. You see, there’s a three-year-old Upland kid named Teddy who, unfortunately, was born with a rare genetic disease called Fanconi anemia. Those with Fanconi anemia can have birth defects, developmental disabilities, and endocrine problems. But that’s not all. The majority of those affected by the disease develop cancer, and 90% develop bone marrow failure — the inability to produce blood cells — by age 40. In the year 2000, the average lifespan of those with the disease was 30. Oh, and because Fanconi anemia is so rare — only about 31 people in the U.S., approximately one in 130,000, are born with the disease every year — it’s an orphan disease, which means there’s not a lot of incentive (read profit) in finding a cure. There is an organization called the Fanconi Anemia Research Fund, which has the goal of finding effective treatments — and perhaps a goal — for the disease. Teddy’s family is hosting a fundraiser from 4 to 8 p.m. Saturday (May 12) at the Colonies Crossroads Chipotle, 1053 E. 19th St., Suite A, Upland. All you need to do is show up, order your food, mention the fundraiser or show the flier pictured above on your mobile device, and enjoy your dinner. 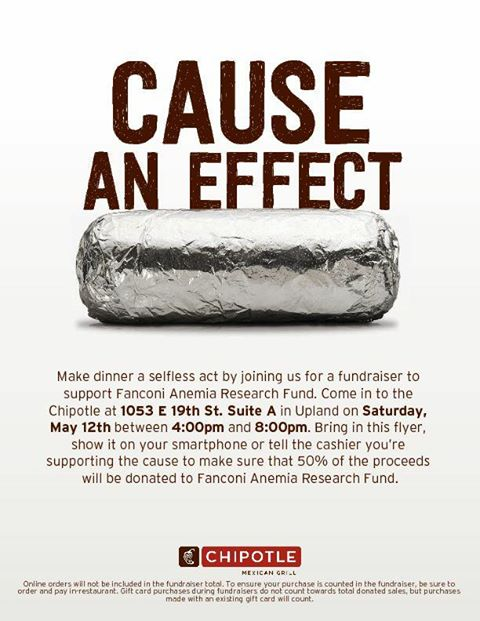 Chipotle will donate 50% of your bill to the Fanconi Anemia Research Fund, so bring your whole family. Heck, bring all your friends and neighbors, too. And if you’re unable to attend Saturday’s fundraiser, you can still help out by following this link. This entry was posted in Mexican, Upland and tagged fundraisers by John Plessel. Bookmark the permalink.